Pioneer SPH-10BT Apple car play Android Auto Pioneer car stereo bluetooth USB BT. Pioneer's SPH-10BT smartphone receiver is designed to provide safer and&###xA0; easier access to your smartphone apps, thanks to the four dedicated hard key buttons for your favourite app access. Safety features such as voice recognition support safer driving. Add to this - when connected with the new Pioneer Smart Sync app - various colour and sound adjustments offer a superior sound experience. Simply connect your smartphone in to the built-in robust cradle, then either wirelessly or wired, pair the free Pioneer Smart Sync app to enjoy a smarter, connected driving experience. Specially designed for easy use and safe driving, you have one-touch access to applications and voice recognition for many functions. Introducing a dynamic evolution in smartphone connectivity and in-car entertainment. Pioneer's SPH-10BT offers state of the art smartphone connectivity, enhanced accessibility, playability and sound quality. A perfect match for todays active lifestyles. Obey local driving laws with built-in Bluetooth (HFP). Wide Band Speech hands-free calling, wireless audio streaming (A2DP) with artist, album, and song search, simple pairing, and control audio (AVRCP), Bluetooth&###xAE; wireless technology has made life in the vehicle safer and more convenient. Pioneer Smart Sync app helps you to utilise your smartphone&###xE2;&###x80;&###x99;s functions. 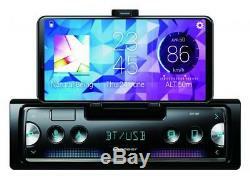 It connects your smartphone to Pioneer&###xE2;&###x80;&###x99;s compatible car stereos. With iPhone Direct Control, you can manage your i-device directly from your car dashboard and enjoy superior sound. Connect and listen to music stored on your device without the need for an app. Connect any device with an USB interface cable to charge your device or listen to clean, clear sound. Adjust your audio output in detail for a music experience tailored to your preferences. Pioneer's ND-PS1 optional rear parking sensors provide visual and audio warning when connected to Pioneer's SPH-10BT. MIXTRAX keeps the party going with a non-stop mix of your music library complete with a range of DJ-inspired effects and club-style illumination. Enjoy FLAC lossless digital audio files in your vehicle with playback output at CD quality, without the need to convert. This product is designed for modern digital music formats. &###xE2;&###x80; MP3, WMA, WAV, FLAC and AAC audio files. Protective Case for Front Panel. &###xE2;&###x80; iPhone X / iPhone 8 / iPhone 8 Plus. &###xE2;&###x80; iPhone 7 / iPhone 7 Plus / iPhone SE. &###xE2;&###x80; iPhone 6s / iPhone 6s Plus / iPhone 6 / iPhone 6 Plus. &###xE2;&###x80; iPhone 5s / iPhone 5c / iPhone 5. &###xE2;&###x80; Siri Eyes Free. MOSFET 50 W x 4 Amplifier. Hands Free Calling (Hands Free Profile). &###xE2;&###x80; 2 Phones Full Time Connection. &###xE2;&###x80; Wide Band Speech. &###xE2;&###x80; Wireless Audio browsing. Wide angle VA LCD Display (1 line). InCarProducts was established in 2007 as an eCommerce division of In Car Products Limited. We are a family run business based in the Northwest. We specialise in Car Audio and Entertainment, from manufacturing to distribution right the way to retail! With our very own brands, Inex, Inex Accessories and SoundMat these are all manufactured to the highest standard. With our very own in house Research and Development you can be sure that we have all the latest products on sale. Under no circumstances will we dispatch to an alternative address. If you cancel within 1 hour but after our daily order cut of time, we also cannot guarantee the cancellation of your order. They may also leave in a secure location; a secure location is normally somewhere that the parcel cannot be seen from the roadside. T is charged at 20%. This is included in the listing unless otherwise stated. If you do not receive your invoice, please check your spam before contacting us for a copy. By purchasing from us you are accepting our'terms and conditions' and also any extras which may not be included but are stated otherwise. This listing is currently undergoing maintenance, we apologise for any inconvenience caused. The item "Pioneer SPH-10BT Apple car play Android Auto Pioneer car stereo bluetooth USB BT" is in sale since Thursday, December 20, 2018. This item is in the category "Vehicle Parts & Accessories\In-Car Technology, GPS & Security\In-Car Entertainment\Car Stereos & Head Units". The seller is "incarproducts" and is located in Warrington. This item can be shipped worldwide.